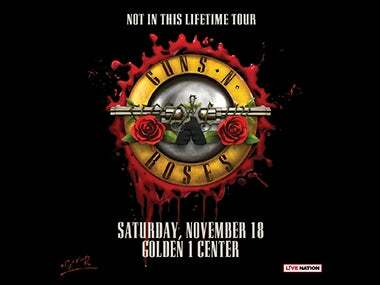 GUNS N' ROSES ADD SACRAMENTO DATE TO "NOT IN THIS LIFETIME TOUR"
SACRAMENTO, CA – Three decades ago today, Guns N' Roses transformed and transfixed the world of rock and roll forever with their seminal debut album Appetite for Destruction. To celebrate the multi-platinum record that welcomed fans to the jungle and topped the Billboard 200, the unprecedented legends of rock are announcing a selection of new stops on their momentous Not In This Lifetime Tour produced by Live Nation. Named the #1 selling tour worldwide for 2017, stadiums were sold out this summer across the UK, Europe, and Israel. The Daily Telegraph said of the London shows "The Guns N' Roses reunion arrived in London and it was big, brash and absolutely brilliant." The highly anticipated North American run of the tour kicks off July 27th in St. Louis, MO and the music icons are revealing eleven more coveted dates including Saturday, November 18 at Golden 1 Center in Sacramento. Citi® is the official presale credit card for the Guns N' Roses Not In This Lifetime tour. As such, Citi® cardmembers will have access to purchase U.S. presale tickets beginning Monday, July 24th at 10:00 a.m. local time until Thursday, July 27th at 10:00 p.m. local time through Citi's Private Pass® program. Tickets for the Los Angeles date November 29th at The Forum will be available beginning Monday, July 31st at 10:00 a.m. local time through Thursday, August 3 at 10:00 p.m. local time. For complete presale details visit www.citiprivatepass.com. AT&T is sending customers to the front of the line with AT&T priority presale ticket access beginning on Wednesday, July 26th at 10:00 a.m. local time through Thursday, July 27th at 10:00 p.m. local time via the AT&T THANKS program. Tickets for the Los Angeles show November 29th at The Forum will be available beginning on Wednesday, August 2nd at 10:00 a.m. local time through Thursday, August 3rd at 10:00 p.m. local time. For complete presale details visit att.com/frontoftheline.com. Tickets for new dates of the Not In This Lifetime tour go on sale to the general public starting Friday, July 28th at 10:00 a.m. local time at Ticketmaster.com. Exclusive Guns N' Roses VIP packages are available for North American dates at vipnation.com. Last night, the band continued their celebration of the 30th anniversary of Appetite for Destruction and the upcoming start of their North American outing with an exclusive show at Harlem's world famous Apollo Theater. The intimate evening for fans was the first time Guns N' Roses performed at the iconic venue. Appetite for Destruction sold 30 million copies globally when it leapt onto the scene in 1987 and became the bestselling U.S. debut in music history.